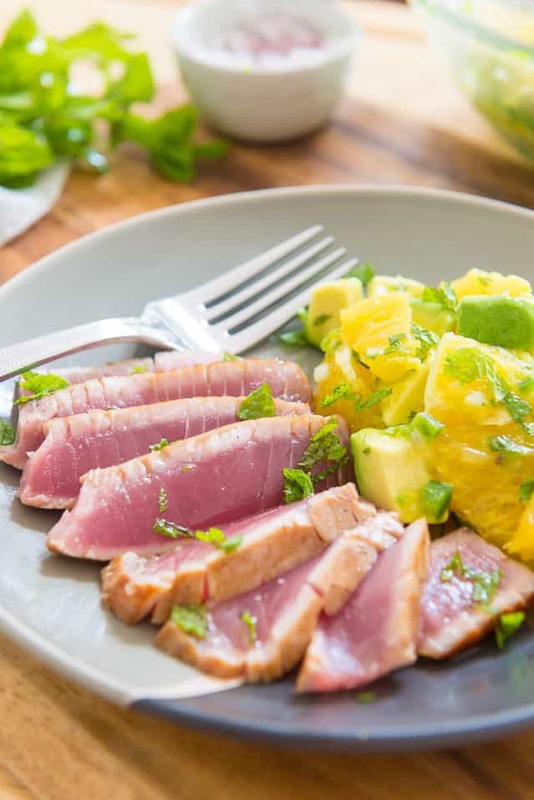 This Seared Ahi Tuna with Orange Avocado Salsa is easy to make, and has tons of flavor. It’s a delicious dinner fit for company or a special occasion! 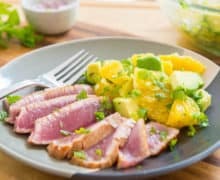 Even though ahi tuna is often thought of as fancy restaurant food, it’s shockingly easy to make at home. 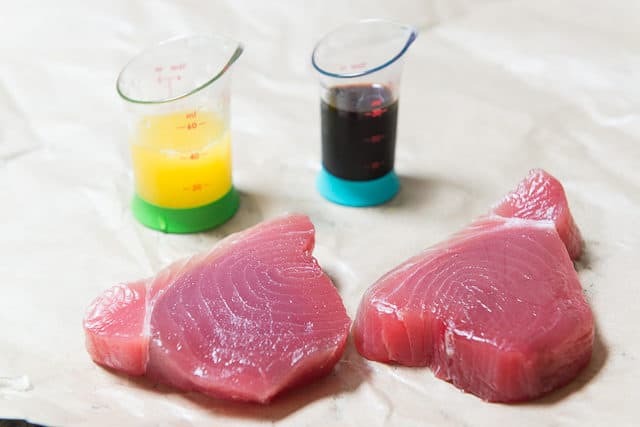 Since most of the enjoyment of ahi tuna is all about cooking it properly and not overpowering the fish, you don’t want the preparation to be overly complicated anyway. 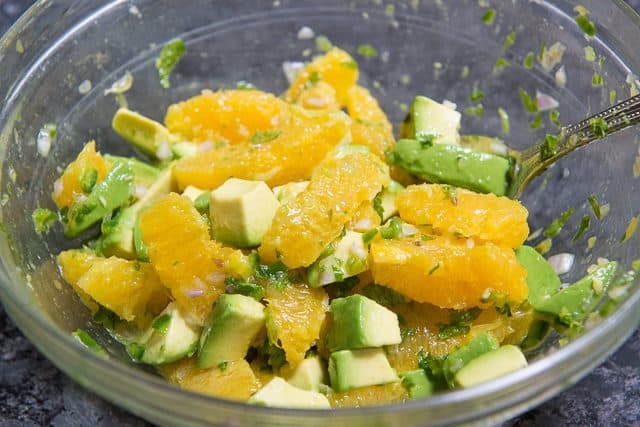 For this recipe, we make a simple 2-ingredient marinade for the fish, and in the meantime make a simple orange avocado salsa with flavors like mint and jalapeno. It’s really refreshing and light, and a fraction of the price of what you’d pay at a restaurant! It’s very simple, but gives a great balance of umami, savory, sweet, and bright. 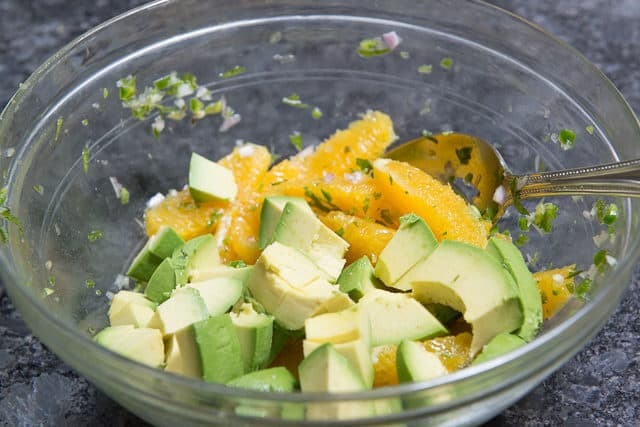 While the ahi marinates, make the orange avocado salsa. Here’s a quick guide for How to Segment an Orange if you’re not sure how to do it. That way you don’t accidentally overmash the avocado while stirring. Then I make sure to rub any pink spots on the sides against the hot skillet as well, to kill any bacteria on the outside. I like to eat them together, with bites of orange and avocado with each bite of tuna. Pan Seared Salmon, Seared Scallops, and Shrimp Salad are some of my other favorite seafood recipes. Enjoy! 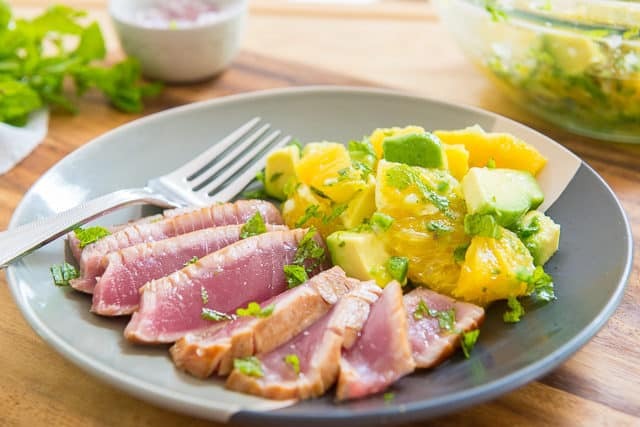 This Seared Ahi Tuna has tons of flavor, paired with an Orange Avocado Salsa on the side. It's a delicious dinner fit for company or a special occasion! 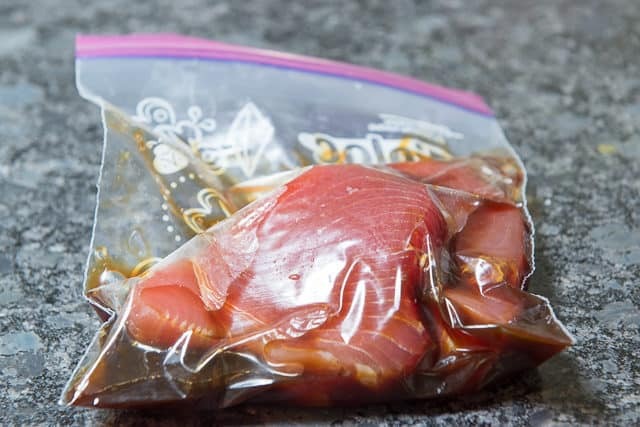 Place the soy sauce, orange juice, and tuna steaks into a bag, and let marinate in the fridge for 30 minutes. In the meantime, prepare the salsa. Cut the oranges into segments (see How to Segment an Orange if you don't know how), and place into a bowl. Add the jalapeno, mint, shallot, oil, and 1/8 tsp salt, and stir to combine. Add the avocado and remaining 1/8 tsp salt, and toss gently, just enough to coat the avocado with the other ingredients. Preheat a skillet, preferably cast iron, over high heat, until the pan starts to smoke. Add the high heat cooking oil, then sear the tuna on each side for about 60-90 seconds, until browned. 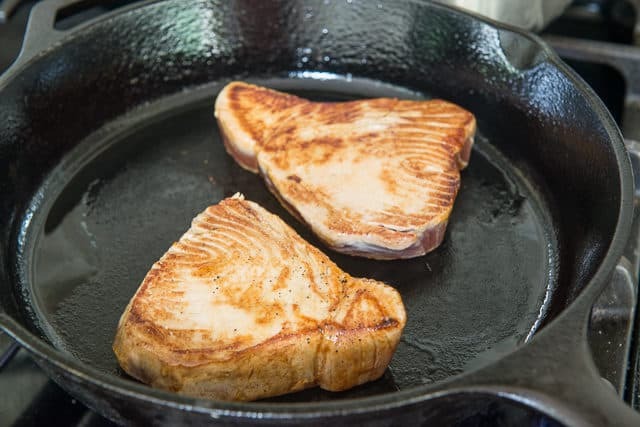 The pan should be hot enough that it sizzles loudly when you add the tuna. 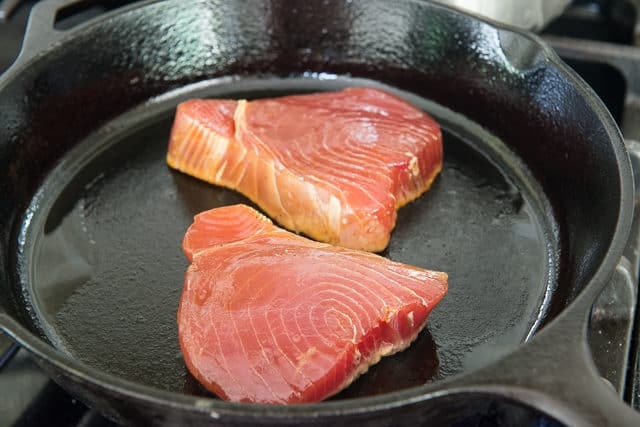 Once the bottom and top are seared and golden, rub any leftover exposed pink surfaces on the sides against the pan, to cook all exterior parts of the fish. 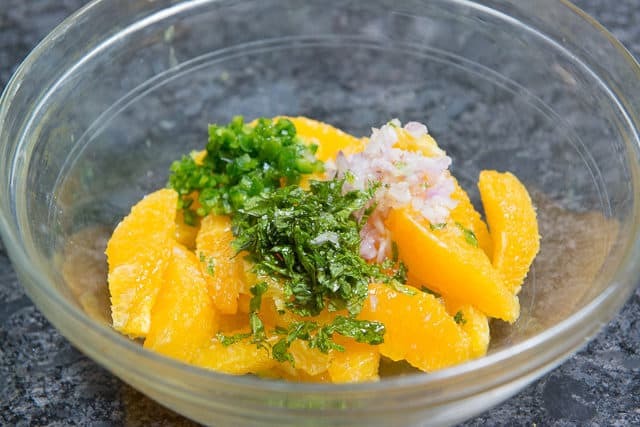 Thinly slice the fish, then arrange on a plate with the orange avocado salsa on the side. Enjoy! Post updated October 2018. Originally published December 2010. My husband would love this meal! This looks delicious, and will be perfect with oranges showing up for the season! I am really enjoying all of your posts! 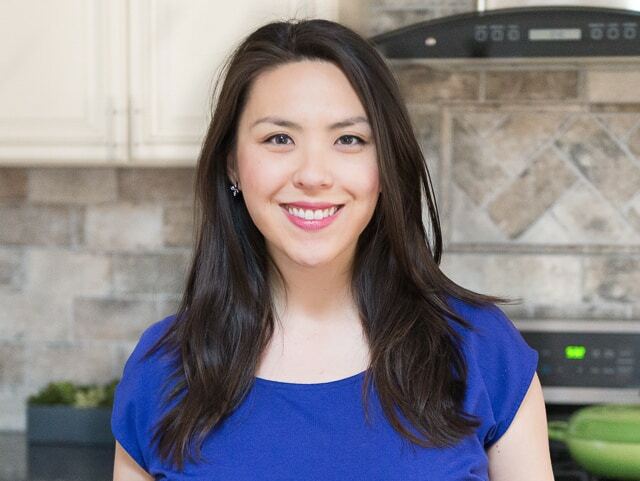 your blog is really beautiful! What kind of camera / lens / lighting are you using? Hi! Thank you =) Haha, not using any fancy camera. It’s actually a test production camera that my husband’s dad gave to us (just a point and shoot). I will be getting a dSLR soon, and am very excited to take better photos!